This pork loin is a hearty main that's sure to get the whole family gathered around the table this weekend. Use the leftovers to make delicious Cuban Sandwiches the next day for lunch! Combine all marinade ingredients in a mini chopper and puree until smooth. Pat pork loin dry with paper towels and score fat in a 1" crosshatch pattern. Place scored pork loin in a large bowl and cover with marinade. Marinate at room temperature for at least one hour, or overnight in the refrigerator. 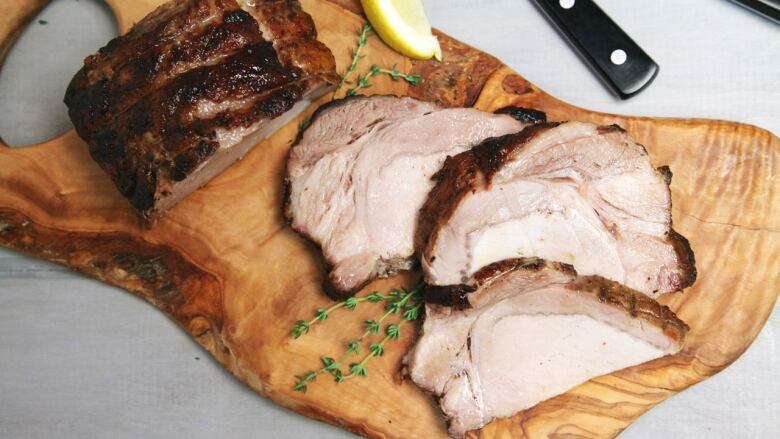 If marinating overnight, allow pork roast to come to room temperature before cooking. Preheat oven to 425F. Place pork roast fat side up on a wire rack on top of a parchment lined baking sheet, wipe off any excess marinade and roast for approximately 20 minutes per pound, until a thermometer registers 165F. Tent with foil and rest for at least 40 minutes before slicing.